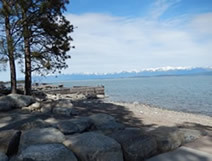 The lake and lakeshore protection zone is defined as, the land area which is located within 20 horizontal feet of the perimeter of the lake, including adjacent wetlands, when the lake is at the mean annual high water elevation. Conserve and protect the value of the lakes for the State's residents and visitors who use and enjoy them. When any work on, and/or disturbance of a lake, lakebed or lakeshore protection zone requires the issuance of a Lake and Lakeshore Construction Permit prior to commencement of work. Some exceptions exist to enable general maintenance and minor repairs to structures and shoreline, using hand tools, and meeting certain limitations.